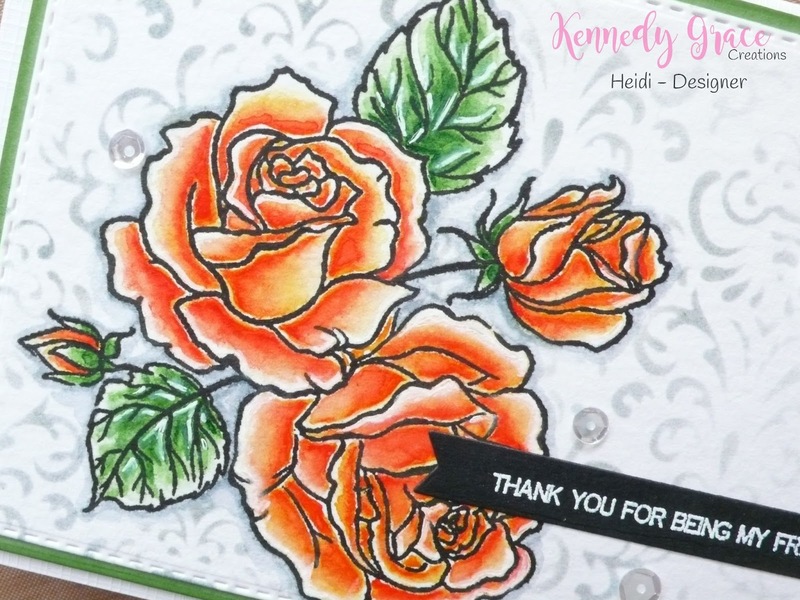 I started this card by stamping the roses from the awesome Kennedy Grace Creations “Splendid Roses” stamp set onto Cornwall Aquarel paper (Grain Fin, bright white) after die cutting a stitched rectangle with one of my nesting dies. For stamping I used Versafine “Onyx Black” ink and my MISTI stamping tool (this aquarel paper is fairly smooth but to get even black lines I needed to ink up my stamp several times). Next I started colouring the image with my Gansai Tambi 36 watercolour set, water and a regular brush. I used the following colours: 33 / 31 / 53 and 58. After all the watercolouring was dry I created some lighter accents with a white Uni-Ball Signo pen. Then I started working on the background: I created a nice damask background with a foam applicator tool, Distress Ink in the colour “Weathered Wood” and a stencil from Scrapberry’s called “Damascus”, going lighter towards the edges of the rectangle panel. I also mixed the same colour Distress ink with some water, applying it with the same brush, making the edges around the roses darker to create the illusion that the roses are in front of the damask background. I adhered this panel to a slightly larger matching green die cut rectangle panel with liquid glue after edging the green panel with some Distress ink in the colour “Mowed Lawn”. 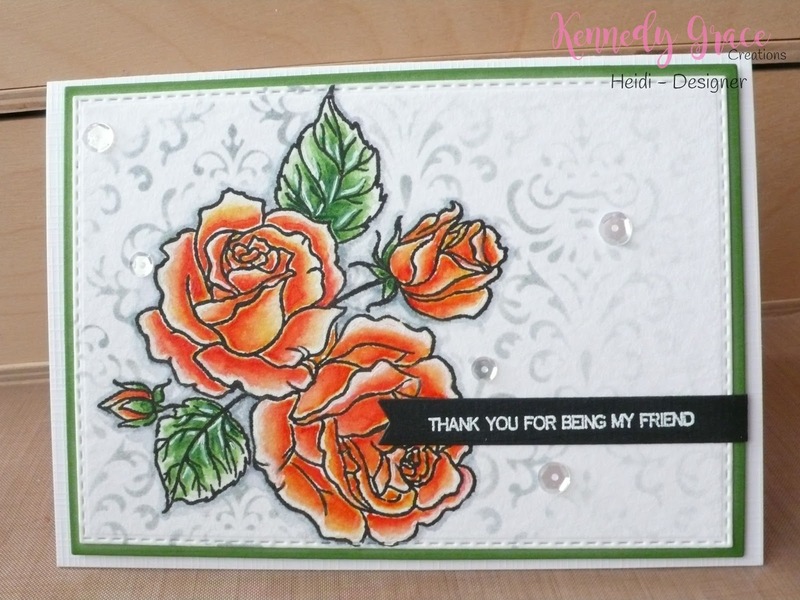 For the sentiment I stamped one of the sentiments from the Kennedy Grace Creations stamp set called “Beautiful Blooms - Sweet Rose” onto some black card stock with Versamark ink and I heat embossed with Ranger “White” Super Fine Detail embossing powder. Next I die cut the sentiment with the smallest die in the Lawn Fawn “Everyday Sentiment Banners” die set and adhered the banner to the panel with the roses with Ranger medium matte, folding it to the back on the right hand side and adhering it to the back with regular tape.Then I adhered the combined rectangle panels to a white linen textured card base with one millimetre thick foam tape. I finished this card with some of the gorgeous Kennedy Grace Creations “Moonbeams” sequins (adhered with Ranger medium matte). And that’s it for today, I hope you enjoyed!